If you love the decorative nature of delicate china and pottery, then this design is for you. It features a beautiful Ginger Jar with a pretty springtime cherry blossom pattern. 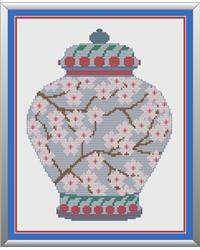 The main body of the jar is light blue with tree branches spreading across it covered in pink and white cherry blossom. The lid and base of the jar have cherry fruits and leaves on them. The design comprises whole stitches, four fractionals and a fair amount of backstitch. Project Size: 7" x 9"